Get set for Easter with the April issue of Vegan Food & Living. 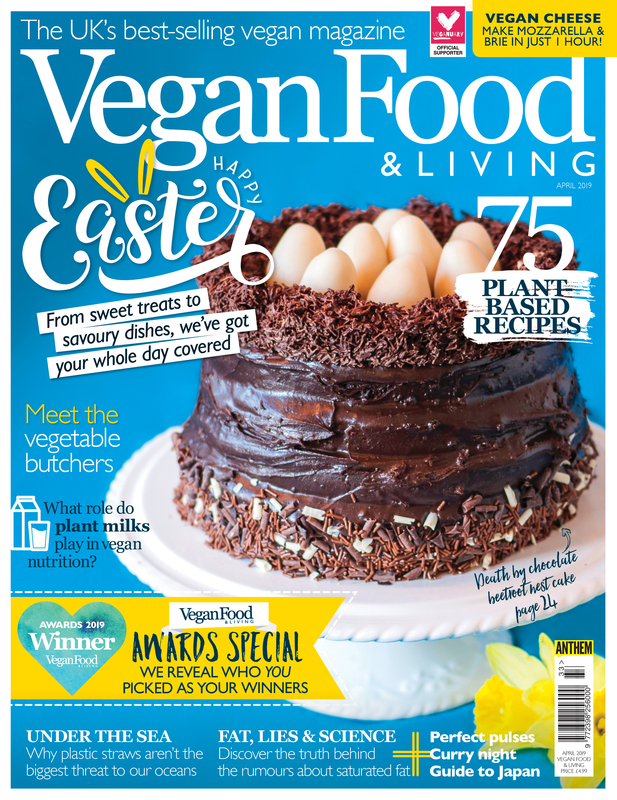 Easter is fast approaching, so if you’re starting to think about which sweet and savoury delights you’re going to enjoy over the long weekend, look no further than the April issue of Vegan Food & Living. From the Death by Chocolate Beetroot Nest Cake cover star to Leek and Pea Aranchini, Leek and Thyme Savoury Scones and Mini Earl Grey Simnel Cakes we’ve got plenty of inspiration. Also this issue, we reveal the winners of our first ever Vegan Food & Living Awards, meet the vegetable butchers and discover what roles plant milks play in vegan nutrition. We also reveal how to make vegan mozzarella, brie and golden Swiss in under an hour, get creative with pulses and grains, and cook up a curry night feast. If that’s not enough, we explore the concept of what it means to be vegan, discover why plastic straws aren’t the biggest threat to our oceans and reveal the truth behind the rumours about saturated fat. Get all this and more in the April issue of Vegan Food & Living, on sale now. Pick up your copy of Vegan Food & Living from selected WH Smith, Tesco, Asda, Sainsbury’s, Morrisons, Waitrose, Marks & Spencer, as well as Hobbycraft and independent newsagents. Click here to find your nearest stockist, or alternatively, you can order online from us here. You can also download the digital edition here. Vegan Cookbook – Garden Fresh!